411mania got the chance to check out an early playable demo for the upcoming Metro Exodus game at E3 2018. This is the latest installment of the Metro video game series, based on the Dmitry Glukhovsky novels. The E3 demo featured an early playable demo of Xbox One version. 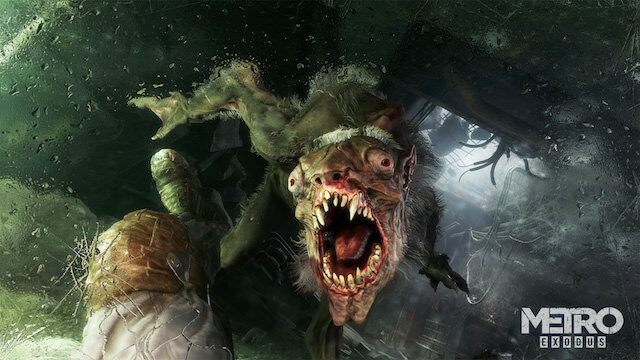 The demo is set some time after Metro: Last Light. Artyom is back as the protagonist. Apparently, parts of the surface of Moscow, Russia are now safe to travel and breathe above air, but they are no less dangerous. Artyom an Anna are still together. They, along with Miller, are going on a mission to investigate the surface. At the start of the demo, they are traversing the harsh wasteland in an old-fashioned steam engine with their comrades before they run into a barricade that stops it in its track. Anna and Arytom are then sent out to investigate a mysterious church. 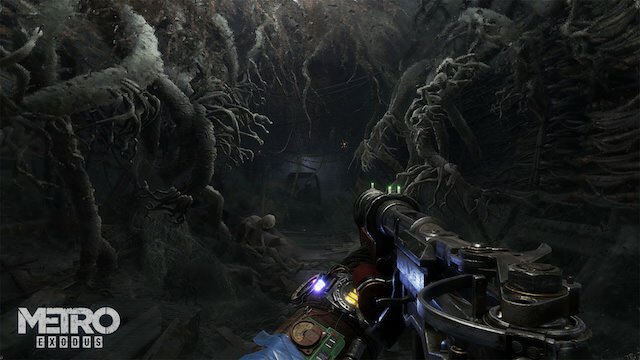 Developer 4A games overhauled the engine for the sequel along with the weapon customization system. 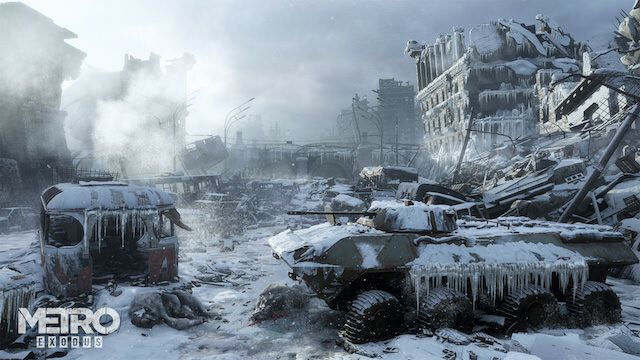 Based on the introduction to the demo, players will have a lot more options on how they can customize and tweak their weapons throughout Metro Exodus. The game will also feature dynamic weather and a day-and-night cycle. While Metro Exodus won’t be an open-world sandbox game, there will be games that feature more open, explorable areas, one of which the demo showcased called The Volga. Eventually, Arytom reaches a small boat, which he can row to a church that remains above the water. A female survivor appears to be there asking for help. It appears for the last 20 years, there were some survivors on the surface, and the Russian government and high command actually survived in some form, so the rest of the Spartans are looking for answers. The church seems to be home to a group of religious fanatics who hate “sinners.” Arytom is able to help a mother and child who are trying to escape this religious cult. Eventually, you have to fight your way out. Like the first game, you can take a stealth or more guns blazing approach. Eventually, you can escape the church and have to go back across the lake and rendezvous with your Spartan Rangers comrades. Unfortunately, the lake is filled with vicious, mutant predators. They also attempt to attack Artyom in his boat, and you have to fight them off. Eventually, the boat is capsized, but an ally is able to pull you out. You are then able to reconvene with Anna, Miller, the other Spartan Rangers, and the survivors you helped from the church. You are then directed to find and work with another survivor, who happens to be a mechanic. What I like about the Metro series is that it has a lot of attention to detail. For gamers who like to take their time and explore environments, there’s a lot to and explore here. Even in the demo, there were lots of character conversations between NPCs you can stumble on that add a lot of texture to this post-apocalyptic world. While post-apocalyptic sci-fi stories might be a dime a dozen, Metro has excellent world building, and the developers do a great job of fleshing out that world and bringing all that world building and lore to life. Now, for some of the flaws. While this was a demo, it was quite buggy. The demo completely crashed on me early on when I was trying to explore some of the open area. The load time for the demo was insane. Even when I died and went back to my last saved checkpoint, the load times were immense. It was harder to get further into the demo with the incessant load times. The controls also left a bit something to be desired. When I attempted to do the stealth approach, the commands for knockout or stealth kills just weren’t super responsive. Hopefully, that gets smoothed out in the final game. Shooting and aiming generally worked well for the most part, but it seems some of the button commands were not as smooth as the rest. Overall, Metro Exodus does look promising with its expanded exploration features and finally getting to explore more of the surface after a nuclear apocalypse. This doesn’t look like a game you are meant to rush through in about five hours, and it looks like there will be a lot to do and explore in Metro Exodus and expanding on the lore of Dmitry Glukhovsky’s novels. Metro Exodus is due out February 22, 2019. The game is being developed for PlayStation 4, Xbox One and Windows PC.